If you have been considering making a donation to the ABI Anthony H.N. Schnelling Endowment Fund, you may benefit by making your contribution by year’s end. Checks mailed to a charity are considered delivered on the date that you mail them. In addition, you can pay by credit card online at abi.org/endowment/ways-to-give, or call (703) 739-0800 by Dec. 31 for your donation to be considered tax-deductible for 2015. Donors at the Sustaining Member Level ($2,000) and up will be recognized at the ABI Annual Spring Meeting in Washington, D.C., on April 15, 2016 (registration information will be posted at abi.org/events at a later date). For questions about payment options, contact ABI Chief Financial Officer Kathy Sheehan at (703) 739-0800 or ksheehan@abi.org. Thank you for considering a contribution to support the Endowment Fund. The generous support we receive from our members and the insolvency community helps us achieve the Endowment’s goal of funding important bankruptcy research and educational activities. Contributions to the ABI Endowment are tax deductible. ABI is a 501(c)(3) tax-exempt organization. Recognized at WLC for their contributions to the Endowment Fund: (l-r, above) Jerry M. Markowitz (Markowitz, Ringel, Trusty, Hartog, P.A. — Legacy Member), Patricia A. Redmond (Stearns, Weaver, Miller, Weissler, Alhadeff & Sitterson, PA — 30th Anniversary Level), Ted Gavin (Gavin/Solmonese LLC — Endowment Fund VP–Development) and Mark G. Stingley (Bryan Cave LLP — Visionary Level). 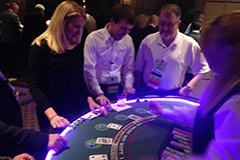 Trying their luck at the Endowment’s Casino Night: (l-r, below) Sharisa Sloan (ABI), Charles Bowles (CARE) and Chip Bowles (Bingham Greenebaum Doll LLP). Jan. 19, 2016—Hockey Night in Philadelphia: Start the new year with a great hockey matchup at Philadelphia’s Wells Fargo Center when the hometown Flyers take on the Toronto Maple Leafs at 7 p.m. Enjoy a fun evening of networking in a luxury suite generously donated by Gavin/Solmonese LLC, complete with food and open bar. Tickets are $200 and benefit the Endowment Fund. This event is sure to be a sell-out! Sponsorships are still available. Firms donating $1,000 will receive a ticket to the suite, signage at the event, and recognition in the ABI Journal and online. A portion of your sponsorship is also tax-deductible! If you are interested in sponsoring this or other Endowment-related events, contact ABI Marketing Manager Sharisa Sloan at 703-739-0800 or ssloan@abiworld.org for more information. This year, the Executive Committee authorized a new annual award to recognize outstanding volunteer achievement. The Anthony H.N. Schnelling Award is presented to an ABI member who has demonstrated innovation and devotion to the cause of the Endowment. 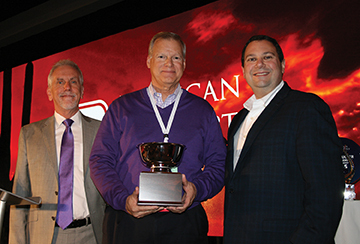 Robert Reynolds (pictured below) was selected as the inaugural recipient for his consistent and effective advocacy on the endowment’s behalf, particularly as a member of the Southeast Bankruptcy Workshop board. Robert led the way to the board’s 100% participation and growth in the silent auction at the workshop, setting a great leadership example for others to follow. Special thanks go to the following members who donated to the silent auction at the Winter Leadership Conference in December: Lisa G. Beckerman – Akin Gump Strauss Hauer & Feld LLP (New York, NY), C. R. (Chip) Bowles, Jr. – Bingham Greenebaum Doll LLP (Louisville, KY), Robert P. Reynolds – Reynolds, Reynolds & Little, LLC (Tuscaloosa, AL) and Jim Shea – Armstrong Teasdale LLP (Las Vegas, NV). Thank you to our auction participants: Brett A. Axelrod – Fox Rothschild LLP (Las Vegas, NV), Bernadette M. Barron – Barron Business Consulting (Chicago, IL), Geoffrey L. Berman – Development Specialists, Inc. (Los Angeles, CA), C.R. “Chip” Bowles – Bingham Greenebaum Doll LLP (Louisville, KY), Elizabeth A. Green – BakerHostetler (Orlando, FL), Hon. Laurel Isicoff – U.S. Bankruptcy Court, Southern District of FL, Jerry Markowitz – Markowitz, Ringel, Trusty + Hartog, P.A. (Miami, FL), James D. Sweet – Sweet DeMarb LLC (Madison, WI), Hon. Madeleine C. Wanslee – U.S. Bankruptcy Court (Phoenix, AZ) and W. Lance Wickel – Epiq Systems, Inc. (New York, NY). Melissa B. Jacoby is the Graham Kenan Professor of Law at the University of North Carolina School of Law (Chapel Hill, N.C.), where she teaches bankruptcy, lending transactions, and contracts. This coming semester, she will also serve as the Robert M. Zinman Resident Scholar at ABI, where she will be involved in a variety of writing and speaking projects. Melissa’s recent scholarship has focused on issues related to municipal bankruptcy, with an article forthcoming in the Yale Journal on Regulation. She has been very active in law reform: In 2011, she testified on venue reform before the House Judiciary Committee, and in 2014, she presented a paper on “Ice Cube Bonds” at the ABI Chapter 11 Reform Symposium, later published in the Yale Law Journal. 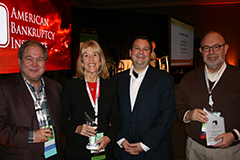 Melissa also served as a panelist at both VALCON and the ABI Winter Leadership Conference in 2014. She is an accomplished teacher; in 2009, she was the inaugural winner of the Byrd teaching award at UNC Law. Her research recently won the Grant Gilmore Award from the American College of Commercial Finance Lawyers and the Chadbourn Award from UNC Law.